Hyacinths have taken their rightful place among the ranks of all-time favorite spring flowering bulbs like tulips and daffodils. Not only do the hyacinths add even more bold and dense colors to the springtime flower garden, they also give you blooms that are of distinctively different forms and shapes than the blooms of their commonly known neighbors. Hyacinth bulbs are planted and treated much the same as any other spring flowering bulb; set them in the garden in the fall of the year before hard freezes have started to occur. Make sure the soil contains plenty of organic matter and that it is sufficiently loose so the bulbs can establish roots. Plant the bulbs, pointed end up, so that they are covered by 4 to 6 inches of soil. A medium layer of mulch (about 3 inches or so) can be added onto the topsoil to assure moisture retention and help deter weed growth. When planting your bulbs, especially if you are establishing a new bed with different types of flowering bulbs intermingled, it’s a good idea to lay out all the bulbs on top of the ground before you start to plant any of them into the soil. This will give you a good idea of what your bed will look like in the springtime when the flowers are up and showing lots of color. Remember to lay out your bed in such a way that the taller-growing bulbs (especially the tulips and daffodils) won’t overshadow and block your view of the lower-growing varieties like the hyacinth and the crocus. The little crocus will do best at the outer edges of your flowerbeds and the hyacinths can be interspersed among their taller neighbors. The hyacinths you will most frequently plant will be of two decidedly different varieties, the Common Hyacinth (Hyacinthus orientalis) and the Grape Hyacinth (Muscari). 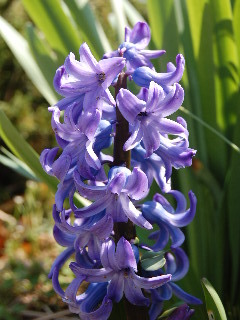 The Common Hyacinth is the bigger, stouter brother of the two varieties, reaching heights of 10 to 12 inches and more. The star-shaped flowers grow densely in clusters along a columnar stalk. Colors range from white to purple, pink, yellow, and shades of blue. The foliage consists of broad fleshy leaves, much like the dense blades of the tulip plants. 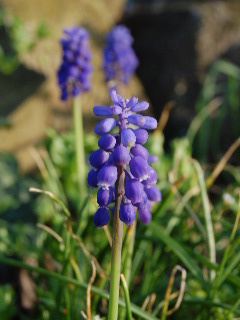 The little brother of the two, the Grape Hyacinth, has a more dainty appearance, not usually reaching heights in excess of 8 inches. The tiny flowers appear in dense spikes that actually look like clusters of grapes growing in an upright fashion. The foliage of the grape hyacinth is also delicate in appearance, looking more like grass than like the leaves of a flowering bulb. Grape hyacinth is limited in color, the most commonly seen being the purple ones which are almost exactly the same color as Concord grapes. Some white grape hyacinths can occasionally be found. The hyacinths do best in full sun but will grow and bloom in partial shade. Just be sure the soil is loose, well-drained, and rich in organic matter. After the hyacinths bloom, you may cut off the spent stalks that held the blooms. But allow the leaves to remain until they turn brown. This will allow the hyacinths to put energy back into the underground bulbs. A moderate amount of good organic fertilizer can be added to the still green plants before they wither. Water this into the soil to give the bulbs an added boost before dormancy. Then add a little more bulb food in the fall as you plant new bulbs. The information contained on this website is provided as a free service to the gardening community. Although GardenVoice.com attempts to keep information up-to-date and accurate, any person or entity that relies on any information obtained from this site does so at his or her own risk. GardenVoice.com shall not be held responsible for any losses cuased by reliance on the accuracy of such information.